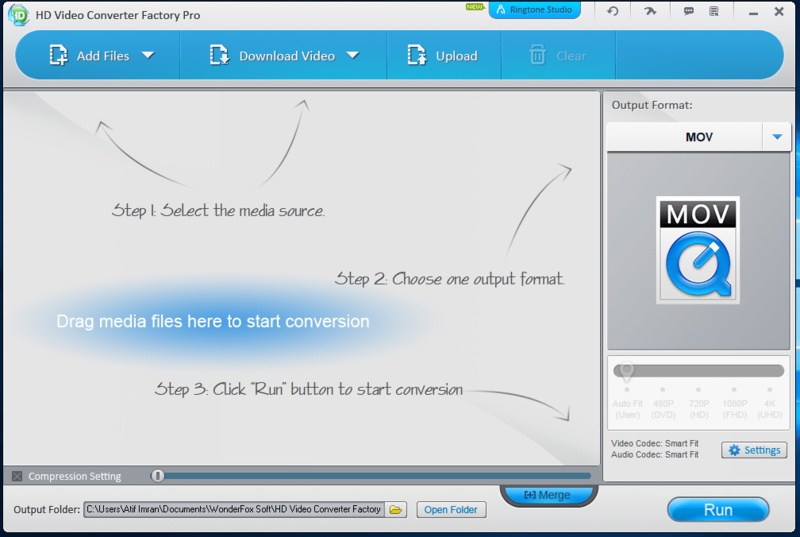 Today I am going to introduce Wonderfox HD Video Converter Factory Pro to you. HD Video Converter Factory Pro is a video converter, video Downloader and has some basic type of video editing functions as well. You must be thinking, In the age of Android and iOS media player apps, Who does need a video converter? Well! Your opinion is valid and I agree with you, But We still need to have a video converter. It would be no exaggeration to say that Google Android and Apple iOS have killed off video conversion programs. Just about ten years ago, A video converter was considered as a must have piece of software for a smart phone or multimedia cell phone user. 3GP and MP4 video formats were supported by both high end and low end smart phones and Smart/multimedia phones were not able to run / playback other video formats. As well as resolution size, bitrate, framerate and other things were a problem. Smart/multimedia phone users had to convert their favorite videos to 3GP and MP4 video formats, along with a plethora of complicated settings. But now the situation has totally changed. Thanks to Android and Apple iOS, You now don’t need to convert to make videos compatible with your smartphone. In case, Your smartphone can’t playback a video format, Not a problem. You can download and install free to use media player apps like VCL play and others to playback an incompatible video format. As well as there is no any other issue like resolution size, bitrate, frame rate etc. But It does not mean that We / smartphone users don’t need video conversion softwares anymore. Yes! We still need a feature rich video converter. There are many situations where We need a video converter like Wonderfox HD Video Converter Factory Pro, I will be addressing 5 situations. There are many Who own a smartphone or a Tablet PC that properly or can’t playback videos with 4K resolution. You can use Wonderfox HD Video Converter Factory Pro to convert a 4k video to a preferred video resolution to make it your phone or Tablet compatible. Wonderfox HD Video Converter Factory Pro comes packed with a truly user friendly and easy to use interface. You don’t need to dig into complicated settings. HD Video Converter Factory Pro has pre-defined output format profiles and all you need to do is choose your preferred output format profile according to your device and click Run to kick start the conversion. MP4/ music players, old TV and other such as devices can’t play MKV and other formats. These types of devices can only run videos with a specific video resolution, framerate, bitrate etc. With the help of Wonderfox HD Video Converter Factory Pro, you can make any video your device compatible with ease and in no time. In addition to videos, You can use Wonderfox HD Video Converter Factory Pro to extract audio from a video. You can convert a video to your desired audio formats. In addition to general users, Wonderfox HD Video Converter Factory Pro is also a perfect piece of software for Facebook pages owners and YouTubers. Wonderfox HD Video Converter Factory Pro has editing functions you can use to merge multiple video clips into one piece, cut / extract a desired piece from any video, crop the video and use video effects. As well as You can add or disable subtitle file which is a very useful feature for YouTubers. Wonderfox HD Video Converter Factory Pro also comes packed with a bonus feature. It has a built in video downloader to download videos from YouTube, DailyMotion and other popular video sharing websites. Although HD Video Converter Factory Pro has an Uploader to upload videos. But this function is not for general users. It does not upload videos to YouTube, Facebook and other video sharing websites. This feature is for webmasters, bloggers and web designers to upload videos to web servers via FTP. All in all, While my test, I found Wonderfox HD Video Converter Factory Pro a feature rich yet easy to install, easy to use and lightweight video converter. I installed it on a Windows 10 PC and till now, I did not face speed and performance or any other issues. People at VideoConverterFactory.Com are giving away a genuine registration code to SoftSuggester.Com readers for free. All you need to do is Go to the giveaway page and click Get It Free to download a ZIP file. Extract the Zip file, You will get a text file containing the registration code and download link. Please do share your experience about Wonderfox HD Video Converter Factory Pro, If You’ve used it.